If you heard that iChat is dead, fear not. It’s alive as ever, but under a new name: Messages. Apple announced on Thursday that when Mountain Lion arrives in late summer, the re-christened, re-icon’ed Messages app will become the new stock instant messaging option. Messages retains all of iChat’s old functionality, but it adds in several new abilities: an option to exchange iMessages, a direct hook into FaceTime, and an updated chatting interface. Apple released a beta version of Messages for Mac users running Lion (at least version 10.7.3). In our hands-on, we've shown you what you can expect when you download the beta, but now we can give you the rundown on what Messages gets right and what still needs some work before a final version arrives this summer. Apple has plenty of time to make changes, so it’s entirely possible that Messages could look markedly different by the time Mountain Lion lands. And the current release really is beta software; you might encounter some crashes or occasional buggy behavior. But here’s our take on the more substantive features of the beta. The incorporation of iMessage is theoretically the big news with the new Messages app. But as significant as that addition is, and we’ll cover it below, perhaps the most immediately apparent change is the app’s redesign. Gone are iChat’s vertically stacked narrow tabs containing the names of the folks you’re chatting with. In their place are taller, wider tabs that convey more information. In addition to displaying your conversants’ names, the tabs also reflect the last time a message was sent in each conversation, along with the text (or an excerpt) itself. It looks quite like the Messages app on the iPad, which is no coincidence. That's iChat on the left, and the more iPad-like Messages on the right. The app’s new look works great when you’re chatting, yet it somehow feels odd next to the buddy list. Slotting your list of contacts right next to your conversation window with its own list of contacts seems wrong—but I’m not sure what the right answer is. Certainly, though, the conversation window’s tabs ought to reflect some of the information that’s currently only in the buddy list: whether a contact is online, away, or offline and whether a contact supports video chatting spring immediately to mind. When you receive new messages, the tab for that conversation will leap to the top of the chatting sidebar. That too is akin to what happens in iOS, but it’s a bit disconcerting when you’re maintaining multiple IM conversations at once; the constant bouncing and tab rearranging quickly becomes a distraction. Don’t be surprised if Apple changes this behavior—or at least offers an option to disable it—before Messages sheds the beta label. As Jason Snell reported already, the mix of iMessaging and IM’ing is a smidgen odd. The app offers no iMessage buddy list. If you have contacts you iMessage but don’t IM, you’ll need to type in their phone numbers or email addresses manually, or add them to a buddy list anyway. And as Jason also pointed out, if you use Messages to send iMessages and your iPhone and/or iPad are nearby, you’ll receive your replies on all your devices, along with your Mac. There’s no easy fix for that problem; Apple can’t suppress iMessages on your iPhone just because it notices you’re near your Mac, because you might not be looking at your Mac’s screen. Still, it seems some sort of solution is necessary; hearing multiple devices ding or vibrate with each message you receive is annoying. You can click and hold on a buddy’s name in the chat window to reveal a menu listing all the ways you can contact him using the Messages app. For most of my contacts, that meant IM addresses, email addresses, and iMessage addresses and numbers. You can switch between, say, IM’ing a friend and iMessaging her through that menu. If your address book and buddy list aren’t in good shape, however, this can get messy; my IMs and iMessages from Dan Moren came in as if they were from two different contacts. 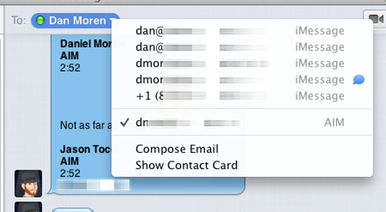 I only have a single record for Dan in Contacts (née Address Book), but my buddy list showed Dan as “Daniel Moren,” which Messages treated as a distinct entity from “Dan Moren.” Editing his profile within Messages helped alleviate the issue, but it’s clear that Apple needs to clean up this process a bit: Messages should better recognize when different accounts belong to the same people based on shared email addresses. The top icon shows that Dan's available to video chat; the bottom indicates that he's not. But without the dark one to compare it to, it's very difficult to tell whether the video chat icon is active or grayed out. At the upper right of the conversation window is a video chatting icon. To my eye, it’s a bit difficult to determine whether the icon is active and clickable or grayed out; the grayed out version ought to be grayer. Though it looks like a button, clicking the icon actually exposes a menu. That menu contains options for placing a FaceTime call to your contact, if possible; if your buddy uses the AIM network, you also get options to place a video or audio call over that network instead—it’s the same way that iChat used to conduct video calls. The AIM video calling options are tucked under an Other option if FaceTime is available for your friend; otherwise, the option appears top-level in the menu. It’s a bit silly: Messages should simply list any options for video chatting and forego the Other menu choice entirely. Frankly, the AIM video calling option is the better option, because FaceTime calls get kicked out to the separate FaceTime app. 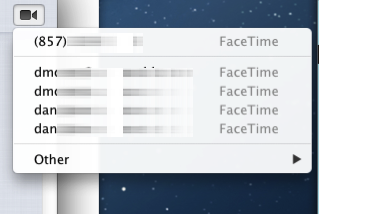 I’d love to see Apple integrate FaceTime calls as seamlessly as AIM video calling works in Messages. AIM video calls support Theater (formerly iChat Theater), and you can drag files on top of the video chat to send them to your contact as well. And, of course, you can very easily paste in links in the chat window as you talk. With FaceTime calls, you instead switch back and forth between two apps, which seems a bit nutty, given that it’s all Apple technology. All in all, though, Messages marks the first time I’d consider switching away from Adium. When I reviewed iChat 6.0, I found that the experience of using the app couldn’t match the benefits of the open source alternative. Messages isn’t perfect, but it offers an interface superior to each iChat incarnation that came before it. For a beta, Messages is impressive. Apple has continually demonstrated its commitment to iChat, and that seems to be continuing with its rebirth as Messages. The app today is good but not great, and I’m optimistic it will improve before Mountain Lion debuts later this year.